Lenovo owned Motorola launched the Moto Z2 Play in India on Thursday. The 4 Moto Mods-supporting smartphone goes up for pre-booking from Thursday itself up till June 14, before it goes on sale via offline stores and Flipkart on June 15. Motorola’s new Mods include – JBL SoundBoost 2, Moto TurboPower pack, Moto Gamepad, and Moto Style Shell with wireless charging. Moto has only brought the 4GB RAM/ 64GB storage variant to India, eschewing the 3GB RAM/ 32GB storage variant for the country. The Moto Z2 Play variant brought to India also supports dual-SIM cards. Motorola is going for an online and offline sales strategy with the Z2 Play. Moto Z2 Play comes in Lunar Gray and Fine Gold color options. 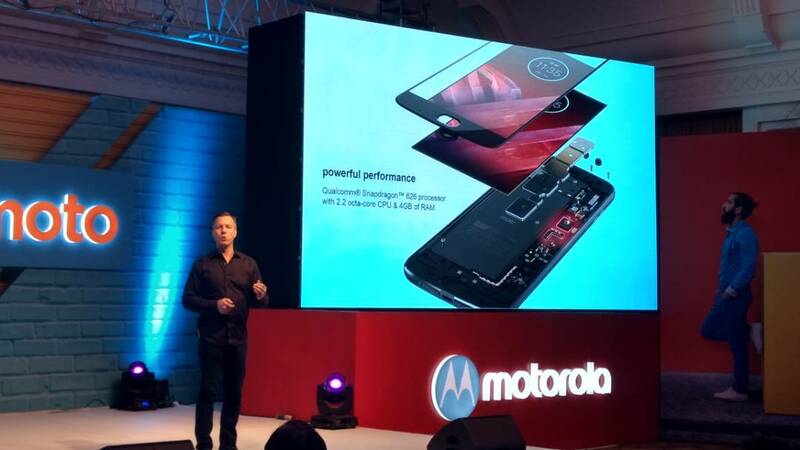 The Motorola Moto Z2 Play price in India is Rs. 27,999, which is higher than the previous phone’s Rs 24,999 price tag. Customers can pre-booking the smartphone by paying Rs. 2,000, and then can choose to pay over 10 months with zero percent interest and zero processing fee. 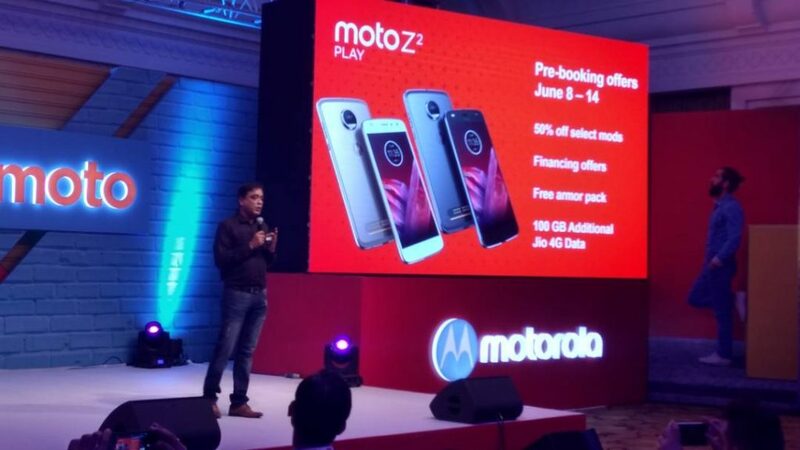 Motorola Moto Z2 Play also comes with some launch offers, including 100GB of Reliance Jio 4G data free. There will be 50 per cent off on some Mods as well. The pre-booking period for Moto Z2 Play is from June 8 to June 14, meaning the phone will officially go on sale after this date. Under Moto’s ‘hello finance’ offers, users can pre-booking the phone for just Rs 2,000 and pay the rest of the balance at 0% interest in 10 months. Moto’s without interest EMI offer is only valid through Bajaj or Homecredit. Alternatively buyers can swipe their credit card to convert the payment into EMI without any interest at select stores. ALSO READ न खरीदें 6जीबी और 8जीबी रैम वाले स्मार्टफोन ! Moto Z2 Play is the successor to Moto Z,and Moto Z Play smartphones announced last year. It is thinner at 5.9 mm, and packs a smaller battery when compared to the original Moto Z Play. Moto Z2 Play features a 5.5 Full HD Super AMOLED display with Corning Gorilla Glass 3 protection and a pixel density of 401ppi. It runs Android 7.1.1 Nougat. Moto Z2 Play gets the new 2.2GHz octa-core Snapdragon 626 processor with Adreno 506 GPU. It comes with 3GB/4GB RAM and 32GB/64GB of internal storage. The memory is expandable up to 2TB via a microSD card. 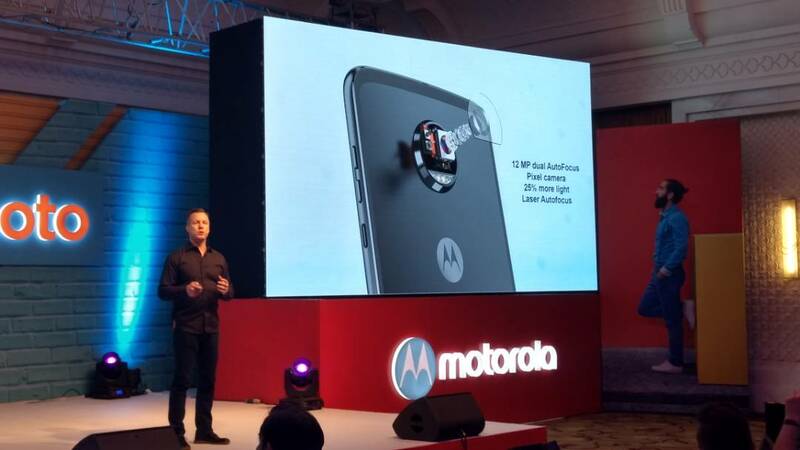 New Moto Z2 Play sports a 12-megapixel rear camera with a 1.4-micron pixel sensor, an aperture of f/1.7, a colour correlated temperature (CCT) dual-LED flash, as well as laser and phase detection dual autofocus lens (laser autofocus with expanded range up to 5 metres and 3 million dual autofocus pixels), At the front, there is a 5-megapixel selfie camera with an f/2.2 aperture, wide-angle lens, and a dual-LED CCT flash. Motorola Moto Z2 Play is backed by a 3,000mAh battery, which is claimed to last for up to 30 hours. It supports company’s TurboPower charging technology, offering up to 8 hours of use in 15 minutes. Moto Z2 Play can be charged to 50 per cent in 30 minutes. Dimensions of Moto Z2 Play are 76.2 x 156.2 x 5.99 mm. It weighs 145 grams. The smartphone sports a water repellent nano-coating. It supports nano SIM card. Sensors on the device include fingerprint sensor, accelerometer, ambient light, gyroscope, magnetometer, proximity, and ultrasonic. Connectivity options on the Moto Z2 Play include 4G VoLTE, Wi-Fi 802.11 a/g/b/n (2.4GHz and 5GHz), Bluetooth 4.2, USB Type-C (3.1), a 3.5mm headphone jack, NFC, FM radio, and GPS/ A-GPS. Sensors on board include accelerometer, ambient light sensor, gyroscope, magnetometer, and proximity sensor. It weighs 145 grams, and measures 156.2×76.2×5.99mm. JBL SoundBoost 2 can be snapped on to Moto Z2 Play to give the smartphone a sound boost. It doesn’t require pairing, promises a 10-hour build-in battery life. It comes with a splashproof coating. JBL SoundBoost 2 weighs 135 grams. Moto TurboPower pack adds an extra day of battery life (3,490mAh) to Moto Z2 Play. The Mod is USB Type-C compatible,and can be charged to 50 per cent capacity in 20 minutes. Moto GamePad has a 1035mAh built-in battery. It comes with dual control sticks and four action buttons. Moto GamePad doesn’t require Bluetooth pairing. Dimensions of Moto GamePad are 226 x 75.9 x 24.4 mm, and it weighs 140 grams. Finally, the new Moto Style Shell support wireless charging. The shell can be snapped on Moto Z smartphones to charge a via wireless pad. They come in four designs – Ebony Burl Wood, Grey Herringbone Nylon, Cateye Wood, and Floral Print. moto z2 play price, moto z2 play, moto z2 play specification, moto z2 play gsmarena, moto z2 play price in india, moto z2 play vs one plus 3. It's time to say hello to a #smarterphone! Watch the live unveiling of #motoz2play here on 8th June, 12:00 PM onwards.